The story – a game of Who’s Your Daddy for Lucy May Barker’s Sophie with three potential candidates, set on an idyllic Greek island – is little more than an excuse to shoehorn ABBA songs in at any and every opportunity. The characters are sketched with the broadest of brushes, to match the equally broad comedy. The set – the barest bones of a Greek taverna that spin around to become the barest bones of a bedroom – is about as simple as musical sets can get. 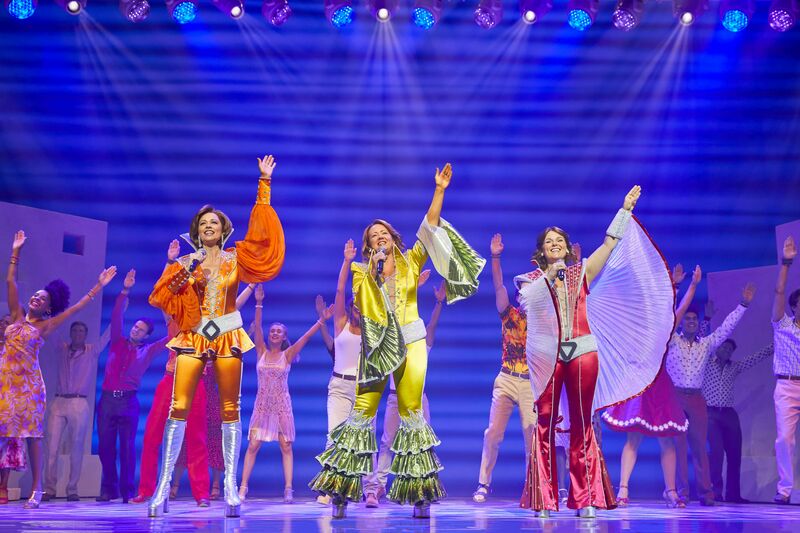 But it’s all sold with gusto, good humour and great singing (even if there’s a little too much of it obviously occurring on a backing track) – and if you’re not up singing and dancing by the end, then I’m not sure what on earth you were doing coming to see Mamma Mia in the first place. Shona White is very much the star of the show as Sophie’s strong single mum Donna Sheridan. She radiates a natural likeability and has a simply gorgeous singing voice – warm, earthy, grown-up – and her barnstorming, emotive rendition of The Winner Takes It All deservedly brings down the house. It’s the kind of confident, accomplished performance that really anchors a show; you just feel at ease whenever White is on stage. In contrast, I found Barker’s singing too nasal for my tastes, and Phillip Ryan as her fiancé Sky has zero presence, but in all honesty, they’re rather thankless roles when the rest of the supporting cast are primed to scene-steal with abandon. Foremost among them is Helen Anker’s glamorous divorcee Tanya; her cougar anthem, Does Your Mother Know, is a hilarious high-energy highlight that fully leans into, then does a funky chicken over the musical’s knowing camp. I also enjoyed Matthew Rutherford’s enthusiastic turn as explorer Bill, one of the potential baby daddies, and his gangly-limbed moves in Take A Chance On Me are deployed to great comic effect. 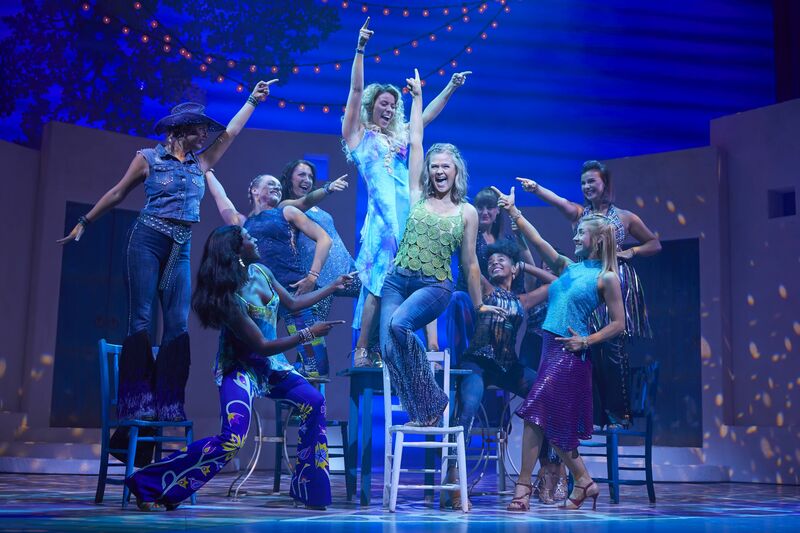 I personally still find Mamma Mia too static as a show (there’s a lot of characters simply halting the action to belt out songs), with the clear stand-out moments coming at the end of both acts. Act One’s closing sequence of Gimme! Gimme! Gimme! segueing into Voulez-Vouz is brilliantly done, with whirling lights, disco beats set to blast and the spirited ensemble finally given some proper dancing to do and nailing it all with finesse. Nevertheless, even that pales into comparison to the end of Act Two, which foregoes any attempt to have anything to do with the plot and instead, just puts on a mini concert with the whole ensemble, complete with Day-Glo sequinned lycra and towering platform boots (further proof of how insignificant Sophie and Sky are to the action – they remain in the boring chinos they ended the show wearing). It’s a totally infectious, exuberant riot of a party that exudes pure joy and leaves you wanting more. 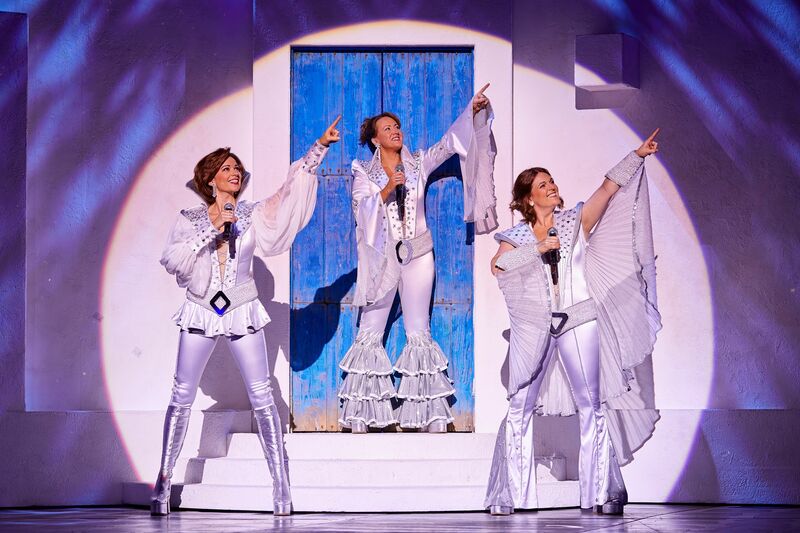 Whilst Mamma Mia might not be the most technically brilliant or emotionally captivating musical, what it does deliver is uplifting, uncomplicated entertainment with some of the greatest pop songs ever created. For a night of feelgood fun in gloomy January, you really can’t do much better than that. Mamma Mia! by Lunchbox Productions is at the Lyric Theatre, Hong Kong Academy of Performing Arts, 16 January-27 January 2019. Tickets cost $395-1195 and are available from www.hkticketing.com.hk. This entry was posted in Culture, Theatre and tagged ABBA, best musical, Helen Anker, HKAPA, Hong Kong Academy of Performing Arts, jukebox musical, Lucy May Barker, Lunchbox Productions, Mamma Mia, Mamma Mia HK, Mamma Mia Hong Kong, Mamma Mia tour, Mamma Mia UK, Matthew Rutherford, musical, Phillip Ryan, review, Shona White, theatre. Bookmark the permalink.